[Special offer] Free solution with all monthly and bi-weekly contact lenses. Only until 24 January! Let’s start the New Year with a special offer! 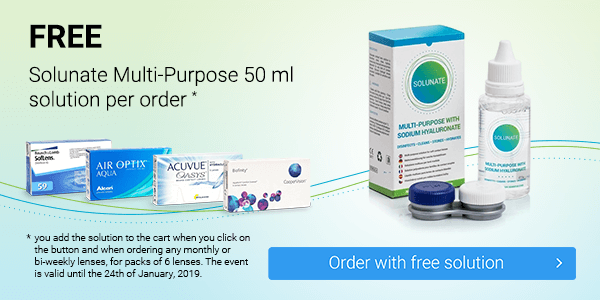 Until 24 January, we will add a free Solunate Multi-Purpose 50 ml solution, introduced in autumn 2018, to all monthly and bi-weekly contact lenses. So, which contact lenses with a free solution are you going to choose? Monthlies– currently the most commonly used lenses for everyday use. Bi-weeklies – lenses with a shorter replacement period. For more sensitive eyes, travel or sport. The special offer only lasts until 24 January. You add the solution to the cart when you click on the button and when ordering any monthly or 2 weekly lenses, packing 6 lenses.